A migrant teenaged girl, who was sold twice and was lucky to escape every time, has unmasked the racket of trafficking of girls from other states to Haryana. The girl was sent to the shelter home in Narnaul today. The Hooda government has unveiled a Rs 500-crore bonanza for farmers by substantially hiking the sugarcane prices for 2013-14 — a populist measure to woo the farming community ahead of next year’s parliamentary and state Assembly elections. Giving a major benefit to sugarcane cultivators, the Haryana Government has doubled the incentive money to farmers sowing advanced varieties of sugarcane through the ring pit method. The incentive money has been increased to Rs 8000 per acre from Rs 4,000 given earlier. The Congress has decided to seek a written clarification from its Gurgaon MP, Rao Inderjit Singh, on his purported exit from the party considering he has not sent a formal resignation to the high command. Representative of the Birohar Barha khap, which had some days ago asked girl students above 10 years of age not to wear ‘objectionable’ attires like jeans/pants, today visited two schools in Jhamri village. They appealed to the girl students not to use mobile phones or wear jeans and tops during school hours. Protesting against delay in commencement of paddy procurement by government agencies, absence of basic facilities and compulsory use of fan to clean the crop, hundreds of farmers of surrounding villages of Karnal today blocked the National Highway Number 1 near grain market, 6 km from here for more than an hour. Out on interim bail for a month in his former staffer Geetika Sharma suicide case, former minister Gopal Kanda has started showing that he still enjoys considerable clout in the government headed by Bhupinder Singh Hooda. With the recovery of three missing students from Gurgaon this morning, the Rewari police, the authorities of the Bharatiya Uchh Vidya Mandir of the nearby Nangal Mundi village as well as the parents of the students have felt relieved. Farmers of 19 villages in the district whose land has been acquired for a railway project held a demonstration today to press for the enhanced compensation in conformity with the recently amended Land Acquisition Act. Chief Minister Bhupinder Singh Hooda has announced one-month exemption in the payment of penalty on road tax up to October 31. This decision will benefit about 70 per cent truck operators in the state. Hundreds of men and women demanding 100 yards plots and release of second instalment of funds under the Priyadarshni Awas Yojana protested under the banner of the SC/BC Adhikar Manch at Mini Secretariat here today. The Gurgaon police arrested local club bouncer Umesh today for illegally possessing five guns and several cartridges. Umesh, however, claimed that weapons belonged to his friend, Raj, a notorious criminal. The police has arrested two youths, Sunil of Harshana Kalan and Naveen of Mahra, who were allegedly involved in drawing amount fraudulently from bank accounts of others by using ATM cards. Saying that there was no official communication about Gurgaon MP Inderjit Singh quitting the party, Chief Minister Bhupinder Singh Hooda has said that the former would realise that his decision was not correct. Following a terrorist attack on a police station and an Army camp in Jammu this morning, in which 12 people were killed, a high alert was sounded by the Army in the Ambala Cantonment. A team of the Town and Country Planning Department today demolished unauthorised constructions, including brick roads, DPCs and offices of property dealers in three illegal colonies near the Chhatehra-Malha and Majra-Nahra-Nahri roads. The poor results in board examinations in government schools has made the Education Department as well as schools rethink on continuing semester system. After the Haryana Board of School Education (HBSE) decided to back out partially in conducting the first semester examination of Class X, the School Principals Association too has urged the board to cancel the first semester examinations. Sources said the victim reached the police station last night after giving the slip to two women acting as agents to sell girls in Bhiwani. It indicates that the racket has been quite active in Bhiwani and Hisar districts, but the failure of the police to bust it has apparently given a boost to such elements. The girl said she accompanied a woman known to her from West Bangal to Bhiwani two days ago on the promise of a job. However, she overheard her talking of a deal with another woman after which she slipped out of her custody. On the way, she asked a motorcyclist for lift, but the biker too started misbehaving with her and she jumped off the running bike and suffered injuries. She finally reached the police at night. City police station SHO Ramesh Kumar said a case had been registered but so far the police was not able to identify the accused in the case. 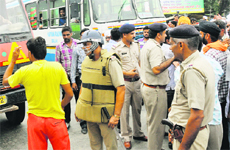 Bhiwani SP Mitesh Jain said the matter was under investigation. Sources said the accused was trying to sell her for Rs 20,000 to a man from a nearby village. Shockingly, she had also been sold to a man in Hansi sometime back but she escaped and rejoined her family. A similar case was detected in Hisar two months ago when the police recovered three girls who were being kept under lock in a house in Agroha town of Hisar. Though the police nabbed five persons, including a woman, and recovered the migrant girls aged between 12 and 22, the probe hit a wall after some days. The new prices, which were approved by the Haryana State Sugar Control Board at a meeting under the chairmanship of Chief Minister Bhupinder Singh Hooda today, are Rs 301 per quintal for the early variety, Rs 295 per quintal for mid-variety and Rs 290 per quintal for late variety. “With this hike, the sugarcane prices in Haryana are the highest in the country,” Hooda claimed. The hike is Rs 25 per quintal for the early variety and Rs 24 for the mid and the last variety.The sharp increase in the sugarcane prices in the pre-poll year is understandable and in sharp contrast to the last year when the farmers had to resort to the stoppage of sugarcane supply to sugar mills to demand the hike in cane prices. Bowing to farmers' demands, Hooda had announced Rs 276 as the rate of early variety for the year 2012-13 (up from Rs 231 per quintal for 2011-12), Rs 271 for mid-variety (from Rs 226) and Rs 266 for late variety (Rs 221). In fact, taking a dig at the Akhilesh government in UP, Hooda said arrears amounting to Rs 2,500 crore were pending with private and government sugarmills in the state while in Haryana no arrears were pending. Meanwhile, Gurnam Singh, president of the state unit of the Bharatiya Kisan Union (BKU), said according to government estimates, the farmer had to spend Rs 236 for producing one quintal of sugarcane. If the recommendations of the Swaminathan Committee and the working group of Chief Ministers, of which Hooda was the chairman, were taken into consideration, the farmer had to be paid 50 per cent more than the input costs. By this logic, the farmer should be paid Rs 354 per quintal, the BKU chief added. An official spokesman said here today that farmers could earn more profit by sowing advanced varieties of sugarcane, namely Co-0238, Co-0239, Co-89003. With a view to curbing diseases of sugarcane crop, the government was also giving a 10 per cent grant on various pesticides. Also, a DAP bag per acre would be provided to farmers sowing advanced varieties of sugarcane at half the rate. The Rao’s reply would be awaited till October 7 before a decision is taken on whether to refer the matter to the Congress Disciplinary Committee. Congress general secretary in charge of Haryana Shakeel Ahmed said today that he would write to Rao Inderjit and seek his clarification on the anti-Congress remarks made in a public rally in Rewari recently. “Whether the issue is referred to the disciplinary committee would depend on the content of his reply. He may say tomorrow that his remarks were distorted or that he wants to continue in the party. The final view will be taken on his reply,” Ahmed said. The Congress has decided to put Inderjit on the mat by making him explain his formal position. If the party expels him, he would get to retain the LS seat. Top Congress sources said the district Congress presidents who had sent their resignations to Rao Inderjit and not to the Pradesh Congress chief or the AICC would face tough action soon. In the line of fire are Rao supporters, including Mahendragarh District Congress chief Rao Ram Singh, Gurgaon DCC leader GL Sharma and another district party chief from Rewari. One block president Manoj Yadav is also likely to face action. They made it clear that they had not proscribed the wearing of jeans and tops at the khap meeting held in Birohar village here on September 22. Farmers waiting at the Mandi with their produce are on tenterhooks, as their paddy is lying in the open and rain threat is looming large. The sheds in the mandi are full to the brim and farmers have no option than to keep their produce in the open. The government has fixed October 1 as the date for starting procurement which could spell doom, said Farmers leader Angrez Singh. Moreover, there are no proper arrangements for water, electricity and no official has cared to visit the mandi and understand the problems faced by the farmer, he added. Meanwhile the Mandi Majdoor Sanghatan, Karnal also suspended operations in the grain market in support of their demand for banning the paddy cleaning in mandis' through electrical fans. President of Bhartiya Majdoor Sangh, Haryana Jung Bhadur Yadav said the administration was informed about health problems in workers due to pollution caused by fans, but no action was taken and the workers were compelled to suspend the work at mandi today. The blockade was lifted after the administration assured the farmers that fans to clean the paddy would not be used in the mandi and urged them to get clean and dry paddy to the mandis. Problems relating to water and electricity would be resolved soon said SDM Mukul Kumar. In less than 20 days of his release, Kanda has got the Executive Officer of Sirsa Municipal Council SK Goyal transferred from Sirsa. Kanda's office today issued a press note, claiming that the transfer orders had been issued by the government with the intervention of Gopal Kanda. "Hundreds of people from Sirsa had met Gopal Kanda on Monday and demanded Goyal's transfer as well as a probe in to irregularities committed during his tenure. Kanda immediately took up the matter with the government and Goyal has been transferred to Bhiwani," said the press note issued. Goyal, however, denied any irregularities on his part, but rather alleged that some contractors close to Gopal Kanda had been pressuring him to clear bills running in rupees several lakhs for the works which were neither sanctioned by the Municipal Council nor any work orders passed by his office. "I am a small fry and cannot match the might of a man who has remained a minister, but I am being targeted merely because I refused to oblige Kanda's people by flouting rules. The contractor close to the former minister had even approached a senior administrative officer of the district for clearance of his bills, but he too refused to intervene, as there was no sanction for the work of streetlights project alleged to have been completed by him," Goyal said. Vikas, Lokesh, both residents of Aulant village, and Sajjan of Nangal village, all three students of Class IX, had reached Guragon after leaving the school on the Tuesday. Thus when they were sitting in a park near the Gurgaon station last evening, they were spotted by Bhoop Singh of Nangal village, who informed the Rewari police as well as their parents. The police brought them here this morning following which they were restored to their parents. A delegation of farmers met the Faridabad Deputy Commissioner twice in three days and urged him to intervene with the government on behalf of farmers. They also submitted a memorandum to the DC, charging the state government of betrayal to the farmers by not fixing the compensation as per the amended Act. They alleged that the award announced last Tuesday was on the basis of the government’s 2012-13 circle rate. At their meeting with the DC, they pointed out a laudatory advertisement regarding the amended law in his office. They also cited the exhortation to the farmers in the advertisement not to be duped in disposing of their land at the rate less than prescribe by the new law. The announcement was made by Hooda at a meeting with representatives of the All-Haryana Truck Operators Union here today. Moreover, the truck operators have also been given the benefit of paying their penalty in instalments on yearly basis. Hooda said as per the present tax structure, vehicles having weight up to one tonne were required to pay Rs 300 as road tax. Similarly, vehicles having weight between one tonne to six tonnes were required to pay road tax of Rs 1,200, for six tonne to 16,200 kg Rs 2400, for 16,200 kg to 25,000 kg Rs 3600 and for above weight multi-axle trucks they were required to pay Rs 4500 annually as road tax. They raised slogans against the state government for not fulfilling its promise. The protesters were demanding plots to those leftout in this scheme, allotment of alternative plot sites which were far away from residential localities and filling of plot sites with soil which were carved in ponds or other low-lying areas. A memorandum of their demands was handed over to ADC Arvind Malhan. Following last year’s directives from the Union Home Ministry, the Gurgaon police arms licensing wing has restricted the release of fresh licences. As per official records, just 30 to 35 licences are being issued each year. The department which was earlier under the District Magistrate, used to issue 60 to 70 licences every year. The police also seized Rs 1.68 lakh and ATM cards from their possession.According to a police spokesman, during interrogation, the accused confessed to their involvement in drawing the amounts from different ATMs in Palampur, Mahipalpur, Kapashera, Azadpur in Delhi, Noida in Uttar Pradesh, Neemuch in Madhya Pradesh, Paonta Sahib and Dehradun in Uttarakhand and several other places. Roshan of Nirthan village, a victim, who lost Rs 10,000 from his account after drawing Rs 15,000 from a PNB ATM, stated that when he reached at the ATM to draw the amount, two youths approached him and said they would draw the amount for him. They drew Rs 15,000 for him and returned the ATM card. However, after sometimes, he received a message on his mobile that he had withdrawn Rs 25,000 from his account. The accused were nabbed by a Special Investigating Team after they were noticed roaming near the ATM yesterday. Addressing a press conference here today, Hooda asserted that whosoever had left the Congress had to come back as it was a big party. “In politics, one cannot ignore the possibilities”, Hooda stated. Hooda said the Congress had played a major role in making Rao Inderjit what he was today. He said Rao Inderjit had been his classfellow and a friend and he would not like to comment on his decision. When asked whether Rao Inderjit’s quitting the party would make any impact in southern Haryana, Hooda referred to many other elected representatives who hailed from that area. Ajay Singh Yadav, Rao Dan Singh, Shruti Choudhry, Rao Narender, Rao Dharampal and Anita Yadav are all from southern Haryana. In reply to a question that whether Rao Inderjit indulged in any anti-party activity, Hooda said HPCC president Phool Chand Mullana could only speak about it. About the appointment of a new president of the HPCC, Hooda said they had already passed a resolution in this regard and forwarded it to AICC president Sonia Gandhi. Hooda said the issue of elections to students’ unions in universities and colleges of the state was under consideration. However, the state was yet to decide on the model to be adopted for the elections, he added. Army sources said though there was no threat as such in Ambala, given the gravity of the situation, the Army undertook an extensive search and surveillance operation in the cantonment as a precautionary measure. The sources confirmed that every nook and corner of the district, especially the Army areas, were searched. The high alert had been sounded to ensure that there was no untoward incident in the district. Meanwhile, heavy movement of the Army convoys was witnessed in the cantonment areas. The Army put up barricades at various points where even the wards of Army officers were checked. Meanwhile, Deputy Commissioner K M Pandurang, denied having any knowledge of the Army operation. He said the district administration had not been taken into confidence before this exercise. Despite opposition from people, the demolition drive was continued with the help of the police. The demolitions included kutcha and brick-aid roads, 55 DPCs and the offices of property dealers in the controlled area of Kharkhoda. As the semester system which was introduced about seven years back is being seen as the main reason behind the poor results, the authorities are planning to withdraw it in a phased manner. Schoolteachers have been demanding withdrawal of the semester system, stating that it's time consuming which reduced study time in two sessions separated by the semester exams, besides leading to poor results . The School Principals Association met HBSE Chairman KC Bhardwaj yesterday, urging him not to conduct the first semester examinations of 10+2. Haryana School Lecturers Association president Dayanand Singh said the association had taken up the issue with the Education Minister and other authorities several times, urging them to abolish the semester system. HBSE secretary Anshaj Singh said the demands of the School Principals Association had been forwarded to the Education Department.